From this we can gather that very few people working on the project were experienced for working on a Red Grouse moor. Just a few examples included the importance of voles in a raptor diet, and no attempt to manage areas to increase their productivity which could offset predation on Red Grouse. Where were the feeding grounds of the Golden Plover? [Bibby showed birds moving 25 miles to feed in Wales!] No management to increase wader breeding areas. [help vole production as well]. 5% of the total area [with more later!] was destroyed removing nesting and wintering Woodcock [game bird], Whinchats, Reed Buntings, voles and mice – some important for feeding raptors especially Hen Harriers. 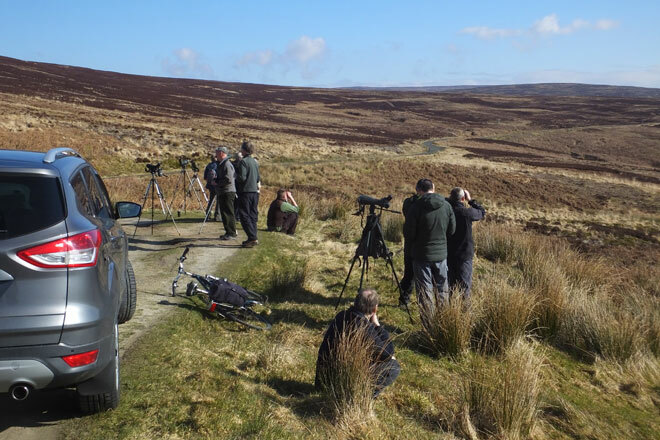 No push to sell Langholm as a place to visit and watch birds and wildlife! But the report claimed – It is not disputed that the loss of grouse shooting also had a significant negative impact on the local economy, though no formal study has been carried out! Then there was the big question why no shooting when Red Grouse stocks were high in 2013 and 2014 seasons? The 10 year plan will claim this was never achieved but they could have shot in 2013 and 2014 but did certain partners want to prove something else? Likewise the attack on Buzzards by one of the partners in the project is still going on in 2018 even when the figures in the this plan they stated – data collected so far thus clearly shows that breeding buzzards provide very few grouse to their chicks. There also appears to be a slight decrease in the proportion of grouse in the buzzard diet (with significant variation between nests) with decreasing vole abundance: from 13% to 2% using prey remains. This counter-intuitive response might be explained by buzzards responding to declining vole abundance on the moor and moving to hunt more on neighbouring farmland. What we are trying to point out is that if this 10 year plan is ever written WHAT WILL WE BE ABLE TO BELIEVE!! One of the partners is well aware of the figures been manipulated and claim they will make this clear in the plan. BUT Given that many of the papers are owned by Red Grouse moor owners you can guess which bits they will encourage their journalists to pick out and deceive the public and ministers from England and Scotland. So finally should the Langholm moor’s shooting rights be taken over by the RSPB [Like they did at Geltsdale] so the real management can begin and the people of Langholm will have a FIRST CLASS RESERVE on their door step bringing 12 months of the year trade to the town [not the few weeks that Red Grouse shooting brings] being only 20 minutes from the M6 and M74? Yet another conservation embarrassment resulting in a mixture of fact, fiction or blatant lies? Both Langholm projects have trundled along over a 25 year period and have basically done nothing to help the cause/plight of the harrier. So much wasted time and money to achieve nothing. At least £3.5 million alone spent on Langholm 2 and still stakeholders can’t even agree on any conclusions/outcomes. Firstly I feel frustrated and sad for the harrier and secondly when it comes to important conservation issues the word honesty can unfortunately never be relied on. How many breeding pairs of Hen harriers are there at Geltsdale? Editor’s Comment. None as far as we are aware.